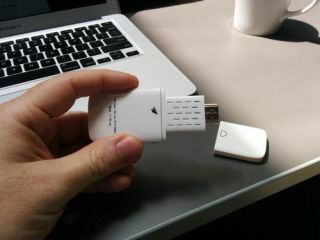 Mozilla working on Chromecast-rivalling TV dongle? | What Hi-Fi? Mozilla working on Chromecast-rivalling TV dongle? Mozilla – the organisation best known for the Firefox internet browser – is reportedly working with "emerging hardware manufacturer" aBitCool on a dongle to rival Google's Chromecast. Initial reports had suggested that the streaming TV stick would be developed by Mozilla, but those claims have since been dismissed by the organisation as being "not a Mozilla project". However, it does seem the web-based Firefox OS software – devised as an alternative to standard mobile operating systems – will feature as part of the proposed new streaming dongle. aBitCool itself has confirmed it will be creating "innovative media products" based on platforms like Firefox OS, but said its "first product is still under wraps" until some point later this year. A Mozilla spokesperson quoted by recode.net said: "The device is an HDMI-streaming stick that allows the user to fling content from compatible mobile or Web apps to an HDTV." It appears as if the anticipated streaming stick from aBitCool will be competing with the Chromecast from Google, as well as the Streaming Stick HDMI dongle launched by Roku in March. The devices plug into the HDMI port on your TV set and let you access a range of films, TV channels, music apps and more. A price and release date for this dongle is, of course, yet to be revealed. Mozilla's Firefox OS was introduced at last year's Mobile World Congress, with phone manufacturers such as LG, Alcatel and ZTE among the first to sign up to make devices using the system. Brazil, Hungary and Spain were among the initial raft of countries to offer Firefox OS handsets, taking on established players such as Android and iOS in the international smartphone OS market.